Bowling them over ... top British bowlers Andy Thomson and John Price, the world number one and seven respectively, were on hand at an open day at Pershore Bowls Centre, which has moved into new and improved premises on the Pershore Trading Estate. Thomson (pictured second from left) and Price (far right), also a television commentator, were joined by Eddie Givens from Drakes Pride (far left) and centre owners Jean and Maurice Rogers. 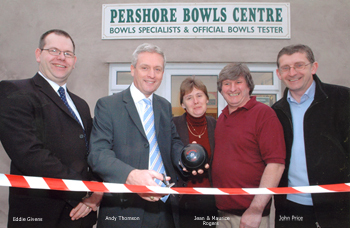 Although still situated on the same trading estate, the Pershore Bowls Centre, near Worcester, is now operating from new premises. Officially opened by England star Andy Thomson, the Building provides much more room for the Rogers family - Maurice, Jean and son Craig - to display more of their bowls products, as well as creating more space for the busy bowls refurbishing and testing area. Pershore Bowls Centre is one of only two official testing centres in England, the other being at the Drakes Pride headquarters in Liverpool. The other two centres in the UK are based in Scotland. This area of business proves fascinating for the many bowlers bringing their woods for testing and refurbishment, so more room has been created for spectators. "I suppose you can appreciate that if someone has travelled as far as 100 miles with perhaps 12 sets of bowls for club colleagues and themselves, then they want to wait and see them getting tested," explains Maurice.